In the 200 years that have elapsed since the 1798 Rebellion the reasons for its failure have been frequently addressed by historians. That the rebels were unable to take Dublin at the outset of the rebellion has been seen as crucial by some historians, for this deprived the rebellion of a focus and prevented the formation of some sort of representative assembly. Again, it has long been evident that the staggered outbreak of the rebellion played into the government’s hands. ‘We may be thankful’, wrote one loyalist at the time, ‘that the insurgents have acted so little in unison and have presented us with the means of beating them separately.’ First the counties around Dublin had risen and been quashed; then a few days later Wexford had erupted and been sealed off; then Antrim and Down had been tamed; and finally, months later, in August/September, Mayo and Sligo and areas in Longford and Westmeath had responded to General Humbert’s ‘invasion’, but it was by that date too late. In addition, some historians have argued that the failure of the French to intervene in large numbers in the early summer of 1798 contributed greatly to, may even have been decisive for, the rebels’ defeat. 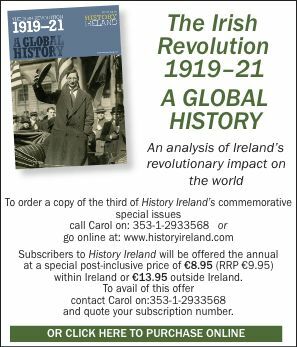 No insurrection in the Atlantic world for 200 years had succeeded without substantial foreign assistance; and the fate of the Irish rebellion was to be no different. A substantial French force would have offered discipline, leadership, weaponry, recognition and perhaps an overall strategy; its absence had deprived the rebels of all of these. Finally, historians have generally agreed that Dublin Castle emerged as victor in the intelligence wars of the 1790s. Its high-placed spies, agents and informers within the ranks of the United Irishmen kept it well briefed on what they were up to and thus enabled it to take decisive counter-measures. James ‘Jemmy’ Hope, the Antrim weaver, United Irishman and long-time radical confided to the annalist of the United Irishmen, R.R. Madden in the 1840s that ‘we were all beset by spies and informers’, and on the basis of his researches, Madden himself concluded that ‘every important proceeding of the United Irishmen was known to the government’. Especially, the late nineteenth-century writer, W.J. Fitzpatrick, devoted much effort to the secret history of the 1790s and in his Secret Service under Pitt (London 1892) he agreed with Madden on the extensive nature of the Castle’s intelligence sources. And yet, despite—or probably because of—this unanimity, there has been no recent appraisal of Dublin Castle’s spies and agents in the 1790s: such an undertaking is therefore timely. Even a cursary examination of the war on subversion in the 1790s turns up spectacular intelligence successes by Dublin Castle, and these have certainly contributed to its reputation for omniscience (and bequeathed to later revolutionaries a pitiless attitude towards alleged informers). The swoop on the Leinster provincial committee at Oliver Bond’s house on 12 March 1798 was made possible by precise information from Thomas Reynolds, a United Irish protegé of Lord Edward Fitzgerald. Two months later, Lord Edward himself was arrested on foot of information disclosed by the Dublin barrister, Francis Magan to his ‘controller’, Francis Higgins (a.k.a. ‘the Sham Squire’) who in turn passed on his hiding-place to the Castle. Throughout 1797-98, Nicholas Mageean of Saintfield kept Lord Downshire and his agent, Revd. John Cleland, well informed on the deliberations of the United Irishmen in counties Down and Antrim. And perhaps most valuable of all, in October 1797, Samuel Turner of Newry divulged full details of the United Irishmen’s ‘French connection’ to the Castle: in particular, he broke the news that Theobald Wolfe Tone was in Paris, and not in the United States. Moreover, these are only the better known of the Castle’s informers, informants, spies and spymasters. A trall through the Rebellion Papers in the National Archives, will uncover many lesser known, though possibly as important, agents. Captain MacNevin and Serjeant Lee of Carrickfergus kept Dublin Castle well apprised of the doings of the alleged disaffected in south Antrim. From all parts, Leonard MacNally, a.k.a. ‘JW’, a leading barrister for the United Irishmen, wrote regularly to the Castle advising it of the mood of the country and of the plans of his clients. For Dublin, Samuel Sproule’s numerous telegrammatic letters bore witness to his tireless pursuit of information on the United Irishmen there, and so too did those of the ‘Sham Squire’, who wrote scores of letters to Under-Secretary Edward Cooke on the goings-on of the United Irishmen and their Catholic allies in the capital. The Boyle brothers, Thomas and Edward, likewise scribbled copious notes, conveying information to the Castle about the United Irishmen in Dublin and surrounding areas. There was at least one ‘Mata Hari’-type of spy: Bella Martin was in government pay in Belfast (keeping an eye on disaffected Militia men), and later in County Kildare (watching the United Irishman, William Aylmer). Lastly, there were the hundreds of informations—sworn statements—collected by magistrates throughout the country which, along with the voluminous correspondence of local worthies and busybodies, when sent on to Dublin Castle, enabled it in theory to have precise knowledge of the spread and organisation of the United Irish conspiracy. In view of these varied sources of information, it is not surprising that historians have placed great weight on the efficacy of the Castle’s intelligence network as a cause of the United Irish failure. Can this view be accepted without question? In the first instance, we should note that while Dublin Castle—and the Home Office—undoubtedly had its intelligence successes in the 1790s, it certainly had its failures too. As stated above, Theobald Wolfe Tone’s true residence was not discovered by Dublin Castle until late 1797, nearly two years after his arrival in Paris—and two years after his friends in Belfast had been informed of it. Again, in the mid-1790s, two of Dublin Castle’s apparently well-placed informers, Edward Newell and William Bird, alias John Smith, broke cover, went public and denounced their controllers, causing huge embarrassment to Dublin Castle, and delivering to the United Irishmen a substantial propaganda victory. Newell’s final letter to Camden is worth quoting: ‘In return for the fifty guineas I received on Saturday I shall give you the truest information I have ever done, and one which it would be highly necessary to attend to—my Lord, the people execrate you!’ In addition, despite its extensive range of informants elsewhere, Dublin Castle was poorly informed on Wexford, or else it was easily misled about the true situation there. In either case, the rising in that county in late May 1798 came as a huge shock to the Castle, all the more unwelcome because it served to re-ignite a rebellion which had shown sure signs of petering out elsewhere. In general, it might be suggested Dublin Castle relied too much on local initiatives in gathering information on subversives in the counties: it was not nearly pro-active enough in seeking out its own agents in areas where the resident gentry or magistrates were ‘supine’. Finally, in the most noteworthy failure of all, a French invasion army of some 14,000 men was mobilised and a French invasion fleet of some fifty ships was assembled at Brest in western France in late 1796, without British intelligence learning of the undertaking. Moreover, as is well known, the French fleet managed to sail out of Brest, evade the blockading ships, make its way to Bantry Bay, spend around two weeks off Bantry (and elsewhere) and then return to its home port largely unchallenged. In the gravest threat faced by the British state between the Armada of 1588 and the threatened German invasion of 1940, British (and Irish) intelligence was found wanting. Secondly, we should be wary of accepting uncritically the judgement of nineteenth-century historians such as W.J. Fitzpatrick on the effectiveness of Castle intelligence in the 1790s. Fitzpatrick, a pious Catholic, wrote and revised most of his work on the secret history of the 1790s at the time of the Fenian conspiracy, a movement which the Catholic Church bitterly denounced. However, for those who admired the ‘men of ‘98’, the Church’s condemnation of the Fenians posed something of a dilemma, for were not the Fenians avowedly following in the footsteps of the United Irishmen? The organisers of illegal societies will see that in spite of the apparent secrecy and ingenuity of their system, informers sit with them at the same council board and dinner table ready at any moment to sell their blood and that the wider the ramifications of conspiracy the greater becomes the certainty of detection. Edward John Newell was ‘in the practice of going through the town of Belfast disguised in the dress of a light horseman, with his face blackened and accompanied be a guard of soldiers, pointing out certain individuals who have in consequence been immediately apprehended and put in prison’. This notion was one which the Catholic Church found serviceable in its campaign to keep people out of conspiracies. For its part, the British government too found the ubiquity of informers useful, for the promise of discoverty might possibly help deter recruits from joining underground conspiracies. And in any case, the alleged Irish propensity to betray one another fitted well into that clutch of negative stereotypes (along with fecklessness, improvidence, laziness, murderousness and inconstancy) that coloured British attitudes towards the Irish in the late nineteenth century. Lastly, it should be noted that secret societies themselves found the alleged presence of those in government pay within their ranks useful, for the existence of these informers offered valuable confirmation of their importance: in addition, the hunt for these renegades gave members something to do while they awaited the great day of insurrection. On all sides, then, there was a general collusion on the prevalence of informers. Once again, however, the effectiveness of such renegades has been assumed rather than demonstrated. Thirdly, it is now well established that in intelligence work, the receipt of information, while important, is by no means the end of the matter. Information has to be properly processed before it can be considered as intelligence. The collection of data is only the first stage in a complex procedure by which information is collated, evaluated, appraised, interpreted and then disseminated to the appropriate authority—military or legal—which then targets specific areas for more information, and so on. Did Dublin Castle have such an information processing structure in the 1790s? It appears not. Edward Cooke, the under-secretary at the centre of the Castle’s intelligence gathering was, in effect, a one-man agency. Throughout the months of 1797 and 1798 he was in receipt of anything from 150 to 200 letters a month and while he performed heroically at his task, undoubtedly it was very difficult to obtain a clear picture of what the United Irishmen were up to. There is some evidence that Cooke had begun to create an effective intelligence-processing structure in late 1797 and early 1798: the arrests at Bond’s house and the capture of Lord Edward Fitzgerald and the Sheares’ brothers can be seen as the product of just such a development. But for most of the 1790s, Dublin Castle had no clear way of distinquishing ‘solid gold’ information from the dross sent in by the many adventurers active in the United Irishmen, and on the fringes of that organisation. Moreover, when Cooke resigned in 1801, his ‘agency’ fell apart because it had relied on his presence to operate efficiently. In Cooke’s absence, Dublin Castle was caught out badly at the time of Robert Emmet’s attempted insurrection in July 1803. I think it my duty as well as inclination to inform your government that there is now here a Counsellor Tone pretending to go to America but that his real design is to go to France and that one Russell who formerly had been in the army and who is one of the most violent democrats on the face of the earth, is going with him. Tone has been paid the greatest compliments here and a subscription of £1,500 raised for him; Sam[uel] Neilson, Rob[ert] and Will[iam] Simms, Coun[sellor William] Sampson, Dr Randal MacDonnell, John and William McCrackens [sic] and many others have private meetings with him and have often gone with him to visit diff[eren]t parts of the coast and taking plans of it; if his and Russell’s papers were examined, I would forfeit my existence if some useful discoveries were not made. There are now in this town sixteen diff[eren]t societies of United Irish and the generality of the people here wish and are very ripe for a revolution. I believe Tone will sail in 3 or 4 days. I have the honour to be etc. In just under 200 words, O’Connor had described the future strategy of the United Irishmen and he had correctly identified the major figures within that organisation, many of whom would be active in 1798. This is one of those letters that evokes a whistle of appreciation from the historian; yet no notice whatsoever appears to have been taken of it at the time or subsequently. O’Connor’s tip that Tone’s ultimate destination was France was completely disregarded; and even his remark that Tone and his companions were taking plans of the coast went unremarked. For most of the 1790s, the reality was that Dublin Castle was not prepared for an intelligence war and did not possess a clear method of distinguishing misinformation or exaggeration from the real thing. Thomas Reynolds-betrayed the Leinster provincial committee. Indeed it might even be suggested that as the letters from informers and informants mounted and Dublin Castle’s information increased, it may be that its intelligence on the United Irishmen and their Defender allies actually diminished. The argument that the Castle’s penetration of the United Irish was a key reason for the failure of their conspiracy remains to be proven. Thomas Bartlett is Professor of Modern Irish History at NUI, Dublin. W.J. Fitzpatrick, The Sham Squire (Dublin 1866).W.J. Fitzpatrick, The Secret Service Under Pitt (London 1892).